Late Sunday, Israel will release the rest of the PA Arab terrorists it agreed to free in the swap deal for kidnapped IDF Sgt. Gilad Shalit. Late Sunday night, the Israeli government will release the hundreds of Palestinian Authority Arab terrorist prisoners it agreed to free in the second and final stage of the swap deal for kidnapped IDF soldier Gilad Shalit. Convoys will depart from Ayalon Prison to the Kerem Shalom Crossing, Allenby, Ofer Prison and Atarot Base at 7:00 p.m. in order to carry out the release, which is scheduled for 10:00 p.m.
Six female prisoners from the Sharon Prison are included in the deal. 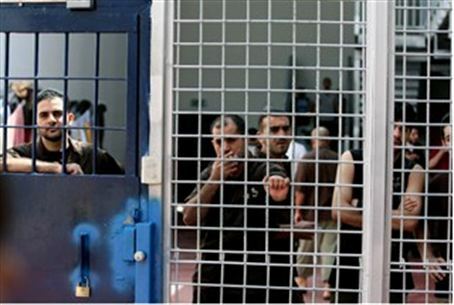 Forty-one prisoners are to be released into Gaza via the Kerem Shalom Crossing, according to Israel Prison Service spokeswoman Sivan Weizman. Two prisoners are set to cross into Jordan via the Allenby Bridge, and two others will be freed in eastern Jerusalem, including one woman, via Atarot Base. At the Beituniya Crossing, four women and 501 male terrorists will be freed to return to their homes in the PA-controlled areas of Judea and Samaria. The IPS spokeswoman, who confirmed to Arutz Sheva that "none" of the prisoners being released belong to the Hamas terrorist organization, nevertheless said she had "no authorization to reveal" which groups the prisoners did belong to. A spokesman for the Justice Ministry who spoke with Arutz Sheva likewise ducked the question, saying he "didn't know" and would have to respond to the query later on "by email."